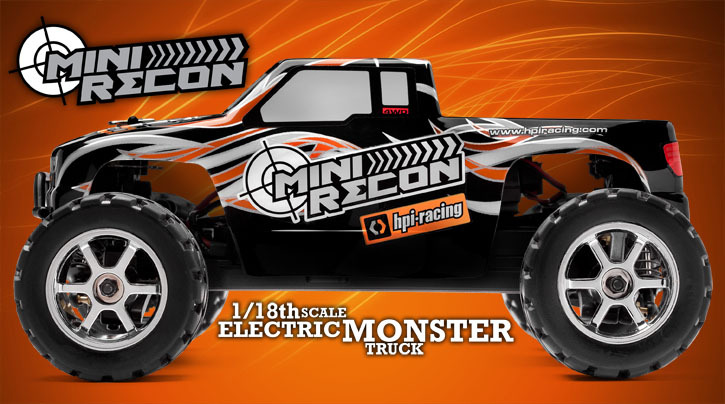 The HPI Mini Recon is the perfect 1/18th scale fun package! Made from extremely tough composite material, the Mini Recon is nearly indestructible. Its powerful 370-size motor accelerates the Mini Recon to incredible top speeds and plenty of fun! 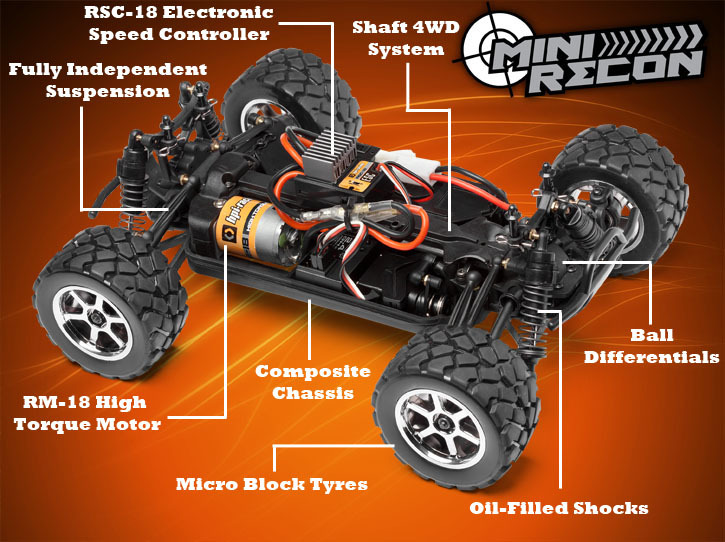 The Mini Recon comes as a true RTR package with absolutely everything you need to get going, including: HPI 2.4GHz radio set, 7.2V NiMH battery, charger and even AA batteries for the transmitter! Everything you need to play with your friends is included in the box! All of the latest HPI kits are now fitted with a comfortable and feature-packed HPI 2.4GHz radio system for supreme control and confidence! The radio features a pistol-grip design with drop-down steering wheel, easy carry handle, fold-down aerial, end point adjustments, servo reversing and steering dual rate. It's also extremely lightweight due to it requiring only four AA batteries. You won't have to worry about radio crystals or what channel other RC racers are using with our 2.4GHz technology - the radio does all that work for you! The radio prevents frequency conflicts automatically and changes channels if there is any interference. Finally, if you ever lose radio signal, an electronic failsafe will bring it to a safe and controlled stop. You'll have professional-level control in one easy RTR package!